Watchful eye: Paul Calello, global head of investment banking and Asia CEO, Credit Suisse. Hong Kong: Asia has proven a bright spot in dismal times for subprime-battered investment banks, but the festive season’s cheer is tempered by gloomy global markets that will make it difficult to repeat a record-breaking 2007 for deal-making in the region. “It’s so nice to be here in Asia where there are smiles on faces and deals to be made," Paul Calello, global head of investment banking and Asia CEO at Credit Suisse Group, said at a holiday party. Investment bankers in Asia, where fee income has leapt 36% this year to $11.7 billion (Rs46,332 crore), according to estimates from Thomson Financial/Freeman and Co. Llc., have plenty of potential deals lined up for 2008, but face markets that are increasingly choosy. A handful of recent Asian initial public offerings (IPOs) have been postponed, while several others have seen their shares fall below offer prices. “In the international markets, there appears to be a flight towards quality and more sensible pricing," said Robert Rankin, head of Asia investment banking at UBS AG. “We think that’ll carry over into the first quarter, and that’s probably a good thing." UBS tops the league table in Asia-Pacific outside Japan this year, Thomson/Freeman data show, but its performance is overshadowed by the Swiss bank’s recent $10 billion writedown, making it Europe’s biggest subprime casualty. Several rivals have also seen solid years in Asia lost amid the subprime maelstrom. For all of this year’s frenzied deal-making in places such as China and India, the region still accounts for a small share of business at global banks. Top-ranked UBS, for example, has generated just 11% of its global core investment banking revenue from Asia this year, excluding Japan and Australia, according to Dealogic Holdings Plc. figures. Goldman Sachs Group Inc. and Morgan Stanley rank second and third respectively in the Thomson league table for Asia, which excludes trading and derivatives. They, along with Bear Stearns and Co. Inc. will report fourth quarter results this week that will shed more light on the extent of the subprime crisis. To handle deals from booming countries led by China—on track to be the world’s busiest IPO market this year—banks have ramped up Asia hiring, even as some shed staff elsewhere. 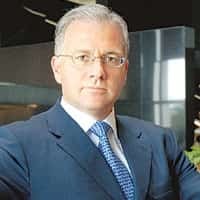 Bear Stearns, hard hit by the subprime crisis, named an Asia chief executive in August, and in October announced a tie-up and stake swap with top Chinese broker CITIC Securities International Co. Ltd. In central Hong Kong, office space is so scarce that Morgan Stanley and Credit Suisse recently signed deals to move their offices across Victoria Harbour to less fashionable Kowloon to accommodate growth, making them the first big banks to do so. UBS expects gross domestic product growth in Asia, excluding Australia and Japan, to ease next year to 8.5% from 8.8% forecast for this year —hardly a gloomy prospect by Western standards. “There is not a decoupling, but what you do have is very high savings rates, and you do have extraordinary growth rates that result in cushioning against the impact of any US recession," said Mark Renton, head of Asia-Pacific investment banking at Citigroup Inc.